Beautiful architecture usually inspires more beautiful art. The Spreckels Mansion is no exception. 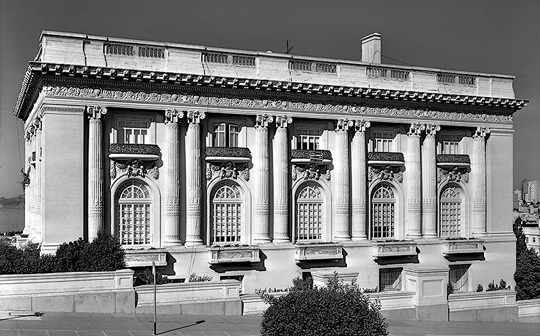 Located in the Pacific Heights area of San Francisco, California and renown for its white limestone façade, this monument has been inspiring designers and artists alike for years.We wanted to take a closer look into the building that many bay-area residents can only hope to get a glimpse into. The Spreckels Mansion was built in 1913 by sugar magnate Adolph Spreckels for his lovely new wife, Alma le Normand de Bretteville. The French Baroque chateau was built on several prime lots overlooking the bay and Golden Gate. Alma was an avid art collector and model – you may recognize her likeness in the Dewey Monument in Union Square – who would later donate the Palace of the Legion of Honor art museum. The 55-room house remained largely unchanged until Alma’s death in 1968. The current owner, romance novelist Danielle Steele, added the row of hedges that now block curious eyes from trying to peer into the historic mansion. At Marvin Gardens, we know that inspiration can be found everywhere. What are some buildings that you find most inspiring? For more information on the Spreckels Mansion, visit NeoHill.